NJ’s Locksmith service Family owned and operated business based in Sydney Eastern Suburbs. The Business owner Nathan is highly experienced locksmiths who has proven record in residential and commercial locksmith services. 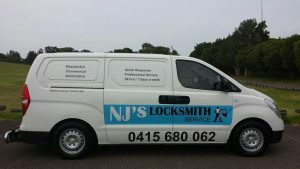 Having 3 vans servicing Sydney wide NJ’S has gained a reputation of on time, reasonably priced locksmiths in Eastern Suburbs And Inner West. NJ’S are a member of the Locksmiths guild of Australia and all members are fully licensed under the N.S.W Police Act. we will be there on time, every time. We have provided customers over the years with quality workmanship and excellent customer service. NJ’s Locksmith Service prides themselves in using quality products and because of this we supply our customers with a 12 month product warranty. We pride ourselves in looking after our customers and providing the right products for their needs. Some of NJ’s Locksmith Service team members have over 10 years experience in the Locksmith Industry.